↑ Toyoshima C. et al (2000). "Crystal structure of the calcium pump of sarcoplasmic reticulum at 2.6 A resolution". Nature 405 (6787): 647–55. doi:10.1038/35015017. PMID 10864315. ↑ Porter K.R; Claude A. & Fullam E.F. (1945). "A study of tissue culture cells by electron microscopy". J Exp Med. 81 (3): 233–246. doi:10.1084/jem.81.3.233. PMC 2135493. PMID 19871454. 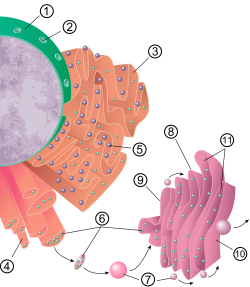 Wikimedia Commons has media related to Endoplasmic reticulum. This page was last changed on 21 February 2019, at 23:06.